Staghorn ferns are tropical epiphytes. Named for their stag horn-shaped leaves, these perennial plants get their nutrients from a source other than soil. In the wild, staghorn ferns (Platycerium bifurcatum) attach themselves to trees, rocks or other plants and wait for plant material, such as falling leaves, to become trapped in their roots. As the organic matter decomposes, it provides the ferns with nutrients. These plants can become quite large, covering a whole portion of a tree's trunk. 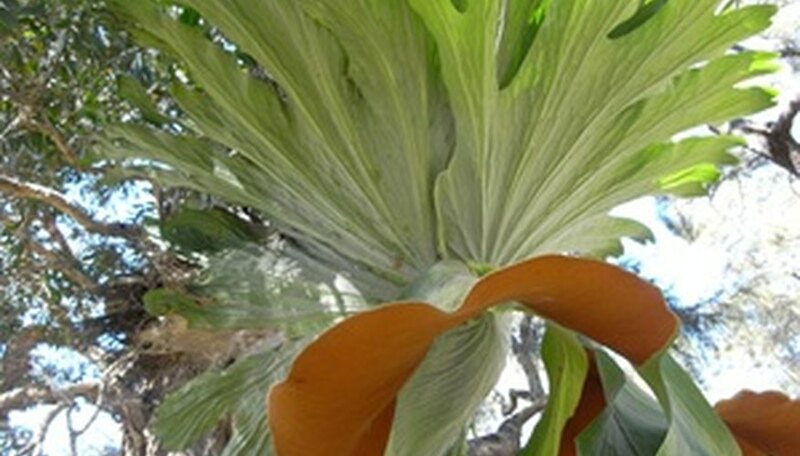 Planting a staghorn fern at home is not difficult, but the process is different from planting a plant that lives in soil. Choose a location that is warm enough and large enough for the fern to grow. These tropical plants should not be planted outdoors in growing zones where the temperatures drop below freezing. In addition, they can grow up to 3 or 4 feet long, depending on the variety, so make sure you have left plenty of room for the staghorn fern to spread out. Soak peat moss, sphagnum moss or a mixture of both of these planting mediums in a bucket of water. You can also use tree bark. Choose enough moss to cover the root ball of the plant. Leave them in the bucket long enough to be thoroughly wet. Remove the planting medium from the water and squeeze out any excess water. Then, form a mound on a piece of (untreated) wood with the materials. Or, fill a wire basket with the materials. Place the roots of the staghorn fern on the pile of planting medium. Make sure the lower, brown fronds (called basal fronds) are touching the medium. If you are mounting the fern to wood, secure it with wire, nylon or string. You can place some nails in the wood to tie to string to it, use a trellis instead of wood or simply wrap the string completely around the wood. As the fern grows, it will cover the string. Then, hang up the wood in a warm, humid location. The same steps should be used for a wire basket. The plant should be secured to the basket with string, nylon or wire, then the basket should be hung sideways. Over time, the "pups," or baby ferns, will grow through the wire on the basket, completely covering it up. Can Potted Ferns Stay Out in Cold Temps? What Phylum Are Ferns In?